Working From Home Today? Let Us Help You Get Started. Let Us Help You Remotely Sign In To Your Work Computer. *If this is your first time signing in, please start at step 1. Otherwise, jump to step 2. 1. To start, we need to configure your IP information so you can access your work computer. Therefore, please submit a ticket with us by calling (973) 882-4644 or email us at support@quikteks.com. If you don’t have access to your work email at this point, you may use your personal email. For your convenience, simply copy and paste the below in the email. Hello, I need to sign in to my work computer from my personal PC. Once you’ve heard back from us (usually within a half hour), proceed to next step. 2. 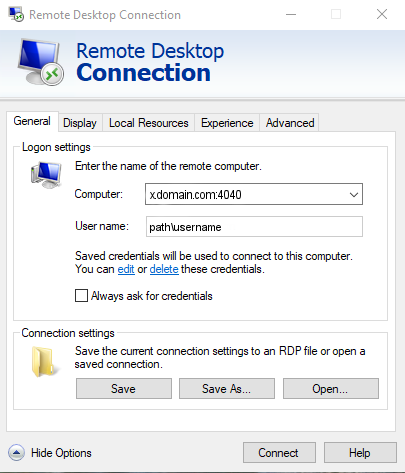 Click the Remote Desktop Connection icon. 3. Enter your login credentials as you normally would sign in to your work office. If these fields are already configured, simply click Connect. 4. If you reach this screen, click Yes. 5. If you use more than one monitor at home, check the box to use all monitors under the Display tab. 6. You may reach a screen like below asking for a second verification. If you have the DuoSecurity mobile app installed, you would have received a login request notification. Open your Duo mobile app and tap the ‘Accept’ button. You should then automatically log in to your office computer. *If this is your first time signing in, please start at step 1. Otherwise, jump to step 3. 1. To access your Windows work computer from your home on a Mac, you’ll need to install Remote Desktop Connection from the Apple Store. 2. Next, we need to configure your IP information so you can access your work computer. Please submit a ticket with us by calling (973) 882-4644 or email at support@quikteks.com. If you don’t have access to your work email at this point, you may use your personal email. For your convenience, simply copy and paste the below in the support ticket. Hello, I need to sign in to my work computer from my personal Mac. I’ve already installed RDC on my Mac. 3. On your desktop, click the Remote Desktop Connection icon. 2. Enter your login credentials as you normally would sign in to your work office. If these fields have already configured during set up, simply click Connect. 3. If you reach this screen, click Yes. 4. If you use more than one monitor at home, check the box to use all monitors under the Display tab. 5. You may reach a screen like below asking for a second verification. If you have the DuoSecurity mobile app installed, you would have received a login request notification. Open your Duo mobile app and tap the ‘Accept’ button. You should then automatically log in to your office computer. Need more help? Give us a call at (973) 882-4644 or email us at support@quikteks.com.